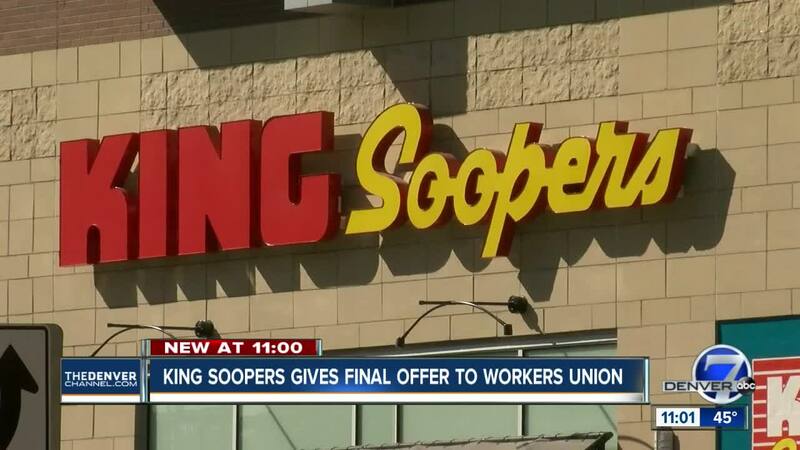 DENVER – King Soopers and City Market has reached a tentative agreement with the UFCW Local 7R union that represents the store’s employees after nearly 40 hours of contract negotiations over the weekend, the Kroger-owned grocery chain announced Monday. Later Monday morning, the union posted what it said were details of the final offer, which union members will still have to vote on before it the agreement is ratifid. "The offer provides industry-leading terms and conditions of employment, including strong wage increases, funding that assures sustainable healhcare through the life of the contract, and the funding needed to sustain retirement benefits," the union wrote. “We are deeply grateful for the strength of our members, the support of our customers, and the help of the communities we work in. Today’s deal represents an important investment in King Soopers and City Market workers and strengthens our ability to continue providing shoppers with the high-quality customer service they deserve. This final offer was the result of more than 37 straight hours of bargaining this weekend and would not have been possible without the courage and strength of our members. Among the details of the final offer are raises for all members of the union, retroactive pay increases, more vacation time for some and enhanced benefits, the union said. Cordova said union members will vote beginning next week. More than 92 percent of union members voted last week to authorize a strike after collective bargaining agreement negotiations, which had been ongoing since mid-December, broke down in recent weeks. The current contract between the union and the company ended Jan. 12. More than 12,000 workers are represented by UFCW Local 7 work at 109 King Soopers and City Market stores in Colorado. King Soopers/City Market released details of a proposal on Friday that preceded the negotiations that happened over the weekend, which said that every associate would get a pay increase over the next year and that there would be no increases to health care contributions. Though both Williamson and the union delivered statements Monday morning about the tentative deal, neither side wished to speak later Monday morning. King Soopers/City Market operates 152 stores. The last strike between workers and the company was back in 1996. It lasted 44 days.